Autumn is finally on its way to meet Grandpa Winter, and the little humans scurry to make things right before the first snow comes. 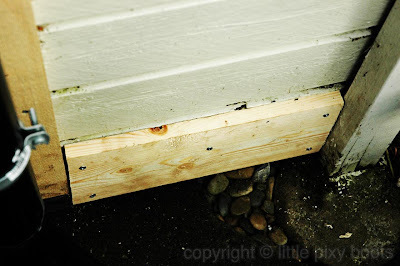 The rotten garage roof, wall and door need to be fixed. Even the floor inside needs to be swept. The shelves with heavy goods needs to be replaced, for the bottom shelf is broken. Our brand new door and roof. A brand new door as above costs NOK 1200 (USD 212) and the roof costs almost three times more, excluding labour. All in all, it must be said that one must be rich to maintain a house in Norway, because snow and rain rot the wood over the years if water drainage is not properly built. Many Norwegians are hands on DIY (do-it-yourself) with such practical construction work, because it's simply too expensive to hire someone to do it. Even neighbours' help comes with a price, but that's just fair. 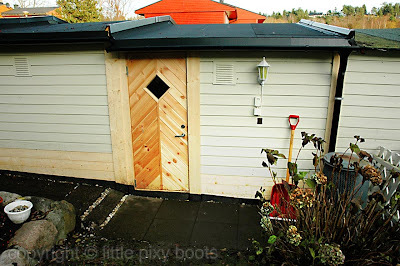 Our kind neighbour, Sir Friendly, helped Viking Man get started by ripping off the roof rather efficiently in 2 hours (rotten black planks and moldy takpapp, the tar-layered "cardboard" used to cover the roof). They also took several hours just buying the new building materials too. I was recovering from a cold, but I put on warm clothes and helped with hammering the planks (planker) underneath the takpapp (I love this word). I must say that I really had fun with hammering with all my might while sitting on the roof and enjoying the view. However, I got a bad backache from bending so much over. Not too bad for an urban city girl who has never done hard physical work in her life. 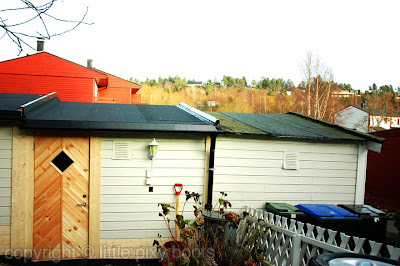 I forgot to take a picture of our old roof, but ours was worse than the one on the right. Our previous takpapp had flew open on a windy night and required 3 heavy rocks to weigh it down. It was green, moldy, and disgusting. The wood underneath was falling into pieces just by touching it. Viking Man added additional water drains and metal edges to prevent rainwater from touching the planks underneath. The edges all have to be covered and protected by metal. It's cool. I like when my man takes charge of defending our roof against the elements. Our door can now open with ease, and I won't have to wrestle to open it against the swollen wooden frame. Of course a lot more needs to be done. We need to paint the door before snow comes, or else we risk the door rotting too. 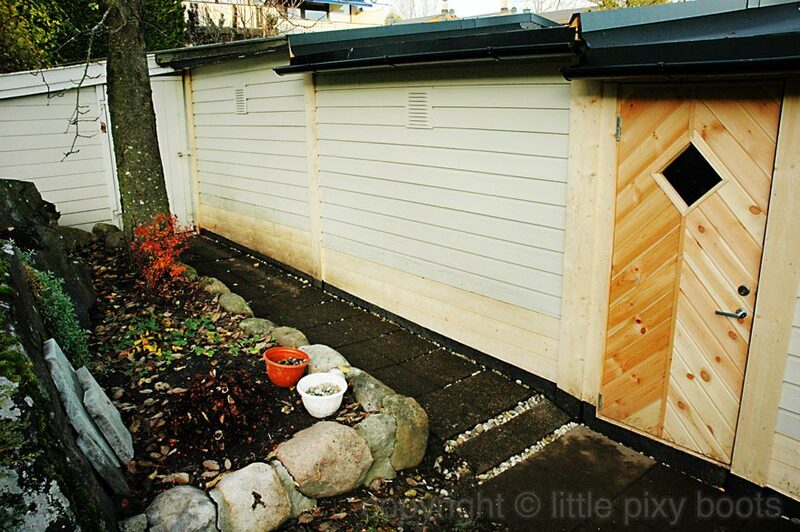 Our neighbours' garage walls were replaced at the bottom, with new planks and takpapp. Viking Man came up with a brilliant idea to line the bottom of the wall with leftover takpapp. It took much work to lift all the cement tiles along the walls, cut the takpapp, lay takpapp, and place the tiles (hyller) back in place. 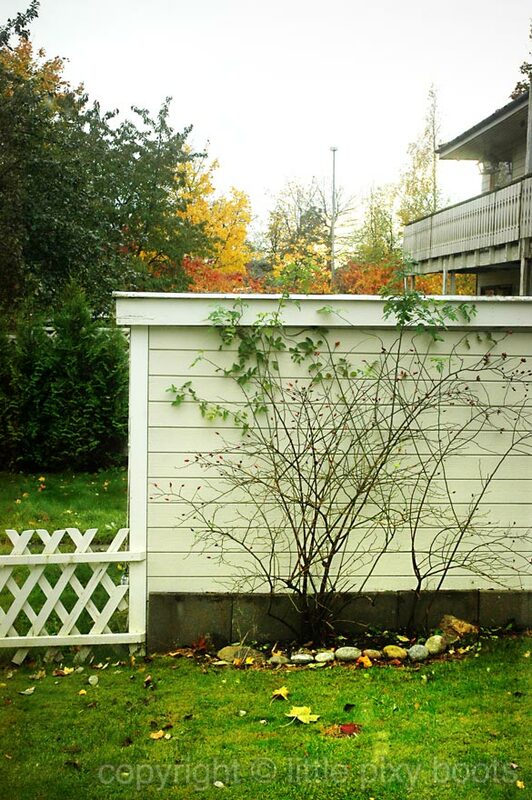 We fortified the edges with pebbles to prevent earth and weeds. The plank I sawed and screwed without supervision. The reason why I showed this humble plank is because I did it without Viking Man around. I learnt how to use one saw myself, and another dangerous-looking round saw. You know those you see in murder dramas? Yep, that's the one. I also figured out how to screw it in. This is to protect the takpapp underneath. In the meantime, we are lucky that the snow hasn't arrived yet. 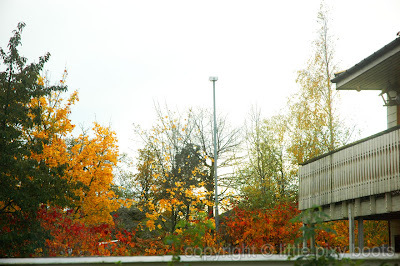 While on the roof, I admired the leaves which were turning into beautiful yellows and reds. Gorgeous. The nype rose bush has lost almost all its leaves. But its skeleton still looks beautiful against the cream wall. Ok, that's all from me, folks!